Happy Anniversary '75ers, 34 years ago, I checked out of my room at the Rodeway Inn in Colorado Springs and boarded a bus for the Academy for in-processing as a Basic Cadet, 5 July 1971. Between the fireworks the night before, my soon-to-be classmates playing ice-cube hockey in the halls, and being gone from my family for the first time, I got maybe an hour's worth of sleep. I remember that first day as a little bewildering, but all-in-all not too bad. Lunch at Mitch's was actually pretty good. I ate what I thought were the biggest and best tasting hamburgers ever. And the upperclassman that was leading my group around seemed really nice. We sat at our table and gazed all over the place as we had our first meal together. I thought to myself, "This doesn't seem too hard. I think I could really like this place!" A few days later, after the M-80 round went off and the-world-as-I-knew-it turned upside down, I wanted more than anything else to curl up into a tiny ball and be as far away from that place as physically possible! Why was everybody shouting? And why at me? Your email provides a great reminder of that Monday morning in Colorado. Of all the important dates, memories, and milestones that come with a 30 year career in the military – only two dates with respect to my time in the military stay forever etched in my conscious: 5 Jul 71 and 4 Jun 75. None of the other 363 days of any year evokes a second consideration . . . not for Promotions, First Solo, Change of Commands – no other! These dates will forever be special until that final trip back to the Academy. Waking up this morning, my first thought (I am at home on 2 weeks leave which gives me plenty of time to reflect) was, "Today is the 5th of July." Followed immediately by memories of my last night as a civilian at the Ramada Inn, the bus ride to the BOR, the haircut, getting and carrying all that stuff around in two laundry bags, and those hamburgers for lunch, the courtesy of the upper class. . . and the start of a personal epic! No words can adequately describe this 34-year ride . . . except perhaps Augustus McCrae's dying words to Woodrow Call from Lonesome Dove: "Doggone Woodrow, it's been quite a party." I will forever feel that Woodrow Call's allegiance to his word, by carrying out the wishes of his best friend (to be buried back in Texas), is the attitude that permeates our class and this special bunch of guys who shared that initiation into a great adventure. Your reminiscing about our first days at the Zoo has also brought back memories for me, but some not so positive as yours. Not until after graduating from high school in June 1971, did I finally find out that I had received an appointment to USAFA, and was ordered to report on 5 July 1971. Therefore, in mid-June, I flew out to Seattle to visit an old girlfriend whose father had been transferred out to Seattle during my senior year. I had an absolutely great next 2 weeks – boating on the Puget Sound and just enjoying being with my "old flame" ("the calm before the storm"). Then, on the evening of 3 July, I had to tear myself away from the great times in Seattle to fly down to C-Springs. However, within just a few hours of landing in C-Springs and checking into my hotel to get some sleep, I began getting extremely ill. As it turned out, I had received a really bad case of food poisoning on the plane to C-Springs. On the early morning of the 4th, I was rushed to the Academy, where they pumped my stomach at the "Cadet Clinic" (down by the Bring Me Men ramp). 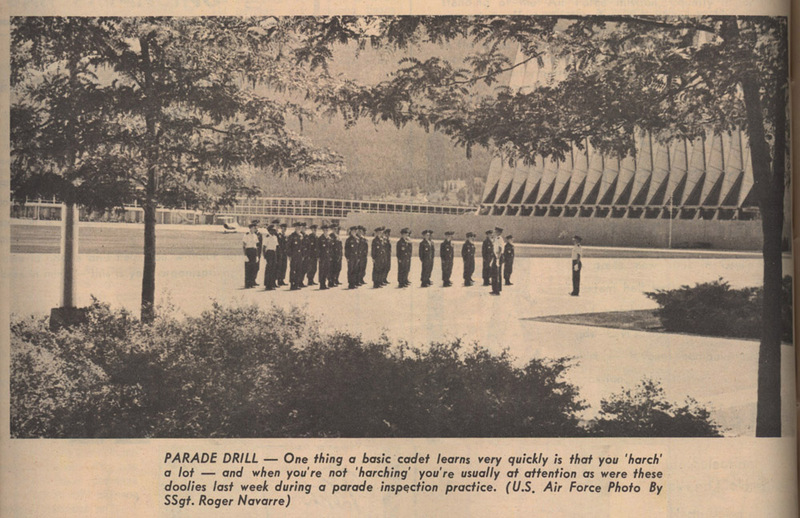 Thus, I had the distinction of being the VERY FIRST member of the Class of 1975 to "use" the USAFA Cadet Clinic – less than 24 hours before we were scheduled to report at o'dark-thirty on July the 5th. IT WAS AN OMEN. I was so dehydrated on the 5th that I could hardly walk, but I was still one of the very first members of the Class of 1975 to report in around 6am on July the 5th. I still often wonder what my life would have been like had I heeded "the OMEN" – and I always come up with both very strong pros and cons. But as you state – the pros always include the great group of people, like yourself, that I had the pleasure to meet and bond with during our 4 years at the Zoo. I enjoyed spending the evening of the 4th with you yesterday and assisting you, Al, and Pogo to celebrate our INDEPENDENCE DAY together. We often tend to forget how so fortunate we are to be able to do so – I have seen so many people around the world who are unable to claim any degree of independence from corrupt and/or homicidal regimes. We actually do have so much to be thankful for. A few days later, after the M-80 round went off and the world as I knew it turned upside down, I wanted more than anything else to curl up into a tiny ball and be as far away from that place as physically possible! Why was everybody shouting? And why at me? I knew why. I knew what to do. It was still a huge experience. Others, like Sam Edgar and Bill Stich in CS-14, had prior active duty experience. Bill was even an SP in the missile field. It didn't look any easier for them in BCT than for the rest of us. The BCT experience was personalized and customized to make sure we all hit bottom emotionally. Someone far smarter than me said that "when you fall off a cliff it doesn't matter how far you fall – you will be at terminal velocity when you hit the ground." Back then, we were allowed to mentally rebuild ourselves under stress. Just as forging or tempering steel produces a stronger alloy, we became more durable and capable, after 1 to 4 years, than before. Classmates like John Sims show how effective, and permanent, the BCT experience was. Thanks for the reminder of when it all started [5 Jul 71]. In fact, I wouldn't have the lovely family I have today if not for the Academy. (Yep...met her at a cadet party, married at the Chapel two days after graduation). Jul 5, 1971: Dink Yurko, myself and one other guy [old timer's moment] from the Col Ferrari (ALO) group arrived on the 4th together on the Old Continental and rode a cab along a gravel road (later Academy Boulevard and Powell Road) to the Ramada next to the Hungry Farmer. Reading through my large batch of email and updates from Jim Carlson, I came across your recollection of those first days in C-Springs . . . the Ramada and Dublin House caught my eye. I've told the story about shooting bottle rockets many times but could never remember who was there. I arrive with the NH "delegation" on Saturday, 3 Jul . . . we flew from Boston's Logan Airport. In the group (about 7 of us as I recall) were Dale Smith, Mark Stickney, John Ladieu, a guy named Wadsack (boy, did he catch hell! ), a couple of other guys, and me. The NH parents group had arranged for us to stay at the Ramada Inn until Monday. As I recall, there were bunch of other guys staying there as well. On Sunday afternoon, a couple of us hitchhiked to the Academy . . . a 2-degree and his "girlfriend" picked us up on I-25 and drove us to the cadet area. The 2-degree had to report back in from his privilege (we would see him again in a couple of days) and left us in the able hands of his "girlfriend" (bad call!). The "girlfriend" showed us the sights and then drove us back to the Ramada Inn. She decided to hang around with us . . . one of our classmates was already playing out the definition of "bird dog" . . . although since we were not yet cadets, I guess it wasn't technically a "bird dog." Perry, thanks a zillion for "filling in the gaps." One of the unfortunate things I have realized over time is how focused I was on the future and not on the present. That has involved me with numerous foibles over time; most specifically, not being able to remember when and where I met friends along the way. Perry, I always knew you were one of the first "other" smacks I met, but could never remember when and how. My apologies to all those along the way I met and could not remember. I'm past embarrassment now and simply ask when we meet. (Even Roy Rice, one of the first drummers I met in the "Beaters and Blowers," has been kind enough to reconnect that synapse (sp?) for me. I do remember all the rest.) I can only hope this is not the early signs of "old-timers," but instead a final maturation. smell the roses along the way." Each one of you has helped me to be the person I am. For that, I am eternally thankful. Ah, yes, Jul 5, 1971. What a day! I remember it like it was yesterday. I remember flying into C-Springs, solo I might add. [I did not know that would be a big deal in the future]. Stayed in the hotel on south Academy Drive, the Galaxy or Solar System or something. I was pretty nervous, except my oldest brother had attended Annapolis and I knew I was smarter and tougher than he was. He struggled through all four years and almost got kicked out in April of his firstie year. Do not remember the name but after all the in processing garbage my first roomate never showed. Bright golden name tag and all by the door and he never shows. Geeeeeezzzzz. Bad omen. I remember Arnold Hall and reforming on the terrazzo. Suddenly, there was a mass of blue suits underneath the old dorm (read Vandenburg Hall) who marched smartly out at us. With the loud signal they started the hazing and yelling. I was never so glad to be in the middle of the doolie squadron (CS-18). Hardly got touched. But by the end of the night I was sick to my stomach. Reported smartly and sharply to the cadet muckity muck in charge of me. They arranged for me to go to the hospital where I was examined by the DOD's best medical staff ..... the result....nothing wrong, just send him back. AAAhhhhhhhhh. No!!!! At least find a hang-nail or something. Needless to say, from Command Post back to CS-18 I was harassed by every upper classman that I ran into. God finally saved me as I had a sudden urge to hurl. Best news is I lived right by the latrine. It was a manly sight and I felt much better and rejoined the rest of the "Best Alivers" for the remainder of four glorious years. I flew in on the Continental Chicago to LA flt #72 (w/ a stop in Colorado Springs) with Tom Finn, my high school classmate. The plane landed on runway 35 (or so) and so when they opened the door to the stairs (no jet-way then) we were looking right at Pikes Peak and were greeted by the hottest/driest wind a kid from Chicago who had only ever traveled to Iowa and Arkansas, had ever known/felt. More in-processing ... could not believe my good fortune with the slide rule and the CRCs they gave us ... underwear, underwear, and more underwear ... lots of green ... haircut; Six barbers; NO WAITING. Jaguar Sq. hmmm; that works ... and then, in turn, introduced to Dave Niebes (BCT roommate) Mike Winck ("haaaa, Mike Winck ... ya know, like the soft drink! ...") and Bob Hickox and Garshelis and Glushko (have you HEARD the new Bob Dylan album? ... uh, NO) and Bruce (get some balls in your voice!) Hopkins and Dave Livingston from "...near Wright-Pat ..." (do tell, what does THAT mean?) and Bruce Murphy (let's talk about Arkansas ... or not) and Rob Morgan (I was thinking of going to William and Mary to play lacrosse; well which is it William or Mary? not in the Big Ten so who knew from William or Mary) and Chip Ward (my brother plays football for Army; I am here to golf) and Bill Davis (let me get this right, you were two years away from graduating at USC ROTC and you did WHAT?) and Rich Dulin (GOOD, someone taller than me and HE can march/walk at the head of the Flt.) and Don Snelgrove and Joey and Barry (hmmm, about that P school ...) ... and ... Jack, Jack Shine; good I can just hide in HIS considerable shadow ... and on and on and ... just a bunch of great guys ... all of them. Wow, just that quickly it turned to night ... so far so good; no restrictions that I could tell on how to walk ... tooling across the terrazzo seemed acceptable ... low ground lights framed the windowed SARs on the terrazzo level of Vandenberg ... upper class seemed friendly enough; so far so good ... who was this Galligan guy they were all talking about and could the stories about this guy 'Olds' from THEIR rookie years really be true? I clearly remember falling-in in front of the Old Dorm and our being posed for the news service pic. I'm sure this was B Flt (doolies destined for 11th Sqdn) but not sure who else from COUGAR was included. It looks to me like only 3 Flts are present. I don't recall anything about the BCT Stardust flight other than the flight itself. I think that the cadet in the "Special Attention" photo is our esteemed Fred Weems but I could be mistaken. What I don't recall is just what the cues were for us to sing these ditties. When I first reported in to the Academy, I was sent to my BCT squadron. When I got to the dorm room door, I saw “Cox, M.E.” on the door tag. I thought, “They got my name tag wrong. I'm Cox, M.D.” Then I went in and met Michael E. Cox. I figured I was sent to the wrong squadron (I was) and had to find someone to point me in the right direction. I did and found I was really in Cougars and my roommate was Eddie Albright. Michael and I eventually discovered there was another Cox in the class – Gary Cox (big guy). We were always in separate squadrons, but kept our eyes out for each other as we went through the zoo. Mike later died on active duty in an F-4 crash. I remember the first time I stood in formation for the lowering of the flag that summer of 1971. I saw the flag flying against a crystal clear sky, realized I was in a national institution, literally the best my country could produce, and felt such awe and respect and determination that I promised myself that I would do my very best to not let my country down. I had tears in my eyes from just being a part of that otherwise routine event. I suddenly recalled an episode in the first meal during Beast after the M-80 demo one balmy evening in July of '71 . . . there I was . . . It was the evening meal, as I recall, and I was sitting quietly at the table with 7 classmates and 2 guidance counselors at the head of the table, enjoying the jocular banter amongst my comrades-in-arms, when it occurred to me that some of my fellow new recruits were desiring some of the sumptuous fare presented to us by the hard working chefs in Mitch's. Having arrived somewhat hurriedly at the table, I had somehow neglected to determine the senior cadet's national and ancient family heritage: this would shortly prove to have enormous consequences on my caloric consumption that night. Being a quick learner, I had determined the proper method of attracting attention to myself was to extend one's fist out over the table and wait for an enthusiastic response from either of the aforementioned guidance counselors at the head of the table. Soon, my turn to state my request was granted. I must interject at this point that I was raised in south Texas in the 60's – not that Texas wasn't a great place to live and experience other cultures – it's just that most of the other culture I had experienced up this point in my life involved jalapeno peppers, tortillas, garlic, onions, and shooting dove from the back of a pickup truck on my way home from football practice. As the senior cadet acknowledged my presence and solicited my question, I initially failed to realize that Cadet First Class James V. Ojala (pronounced “O-juh-luh”) was not from a culture or family lineage associated with any of the above. I quickly realized this oversight when most of the arteries in Cadet Ojala's forehead burst as I pronounced his name as I was accustomed, given my south Texas upbringing (the "j" in Spanish is pronounced as an "h"). I, well in tune with my Spanish lingo, addressed him as Cadet "Oh-halla." In the 3 nanoseconds it took me to realize that he was definitely NOT of Mexican heritage, I also realized he could very easily have passed for Thor's stunt double, complete with bleach-blonde hair, Norwegian blue eyes, steely jaw, and the hammer of thunder welded by lightning strike to his wrist, with which he promptly smote me mightily about the head and shoulders, thereby relieving all classmates at the table from further guidance counselor attention for the rest of the meal. Needless to say, I didn't get to sample much of Mitch's finest that night, but the episode did serve me well in starting down the path of cultural diversity appreciation. I’ll share my first memories of my arrival at the Academy, but they don’t match some of those that are almost hard to believe. Not being from a military background, my only contact with the Academy as I prepared for my arrival, was through my local Academy liaison officer. At the last get together before heading off, I met another Academy bound member of the Class of 75 – Mark Donnelly. I did not have the privilege of having parents bring me to the Academy – so Mark, whom I didn’t really know at all, planned to arrive the evening of July 4th, split a room with me at a hotel somewhere on I-25 (that has probably changed owners 14 times since) and then head to the Academy first thing on the 5th. For some reason I decided to head for Colorado Springs (from Phoenix) later than Mark. I probably wanted to spend more time with my girlfriend whom I had no expectation would blow me off after Christmas doolie year, but many of us experienced that. As I recall, the aircraft was also delayed in arriving but I got to the hotel probably about midnight, got my key at the desk (remember Mark Donnelly and I had agreed to split the cost of the room) and low and behold when I opened the door, the place was pitch black and there were bodies everywhere, including one sleeping in the tub as I recall. Mark always had a big heart (later a Presidential pilot for Air Force One as you know) and generously offered his (our) room to those of you who failed to plan ahead and get a room. So having gotten in so late, and my twin bed “given away” to a needy classmate, I grabbed a bath towel to lay on and spent a very short night on a very hard floor to start my ordeal the next day. Day before entering USAFA…Dad accompanied me to C-Springs from NJ. I think we stayed at the Antlers Plaza or Four Seasons. We wandered down to the bar to get a drink and stumbled onto a lone singer with no audience. After listening for awhile, I thought to myself, this guy with the funny name may have a future. The singer was Cat Stevens. Reading Dan McCorry's e-mail regarding his son’s color blindness situation at USAFA brought back some real vivid memories for me. I too am partially color blind – but I was totally unaware until after my Academy physical exam. However, it seems as though that particular malady affects all of us differently "depending upon the whims, I mean needs, of the service." In late May of 1971, two weeks before I was to report to Annapolis with my appointment to the US Naval Academy, I was called at my home in Frederick. MD and was instructed to report ASAP to the USNA medical Clinic "in order to complete some purely routine paperwork" so that they could finalize my USNA Class of 1975 entrance packet. It turned out that some of my medical test results were not in my USNA files. As a shock to me, (again, less that 2 weeks before my US Naval Academy reporting date, and after I had already turned down a USMA Class of 75 appointment and a scholarship to Georgia Tech) and having not known before that point that I had any color vision problem, I ended up failing all of the Navy's various color blindness tests. I then immediately had my appointment to USNA revoked. However, here comes the "destiny" part – I was then informed by the Master Chief at the USNA Clinic that there were recent changes and that our incoming USAFA Class of 1975 would be the very first class at USAFA to be allowed to admit a few select cadets, already knowing that they already were not medically qualified to become pilots – i.e., with previously disqualifying medical conditions, such as color blindness. (I had not even considered applying to USAFA as I had known that my eye sight was 20/40 and that I consequently had been told the year before that I "shouldn't even think about" an appointment to USAFA). Thus, after returning home from the USNA Clinic "experience," I immediately sent telegrams to each of my congressmen and senators describing my new situation. Luckily for me, just a couple days before our 5 July 1971 report date, I did receive my USAFA appointment... Ironically (and possibly an omen of things to come), I then immediately flew out to C-Springs on the evening of 3 July and contracted a real bad case of food poisoning on the Continental flight (it was the shrimp pasta) and ended up spending much of that 4th of July getting my stomach pumped out as the "very first member of our Class of 1975" to use the USAFA Cadet Clinic... 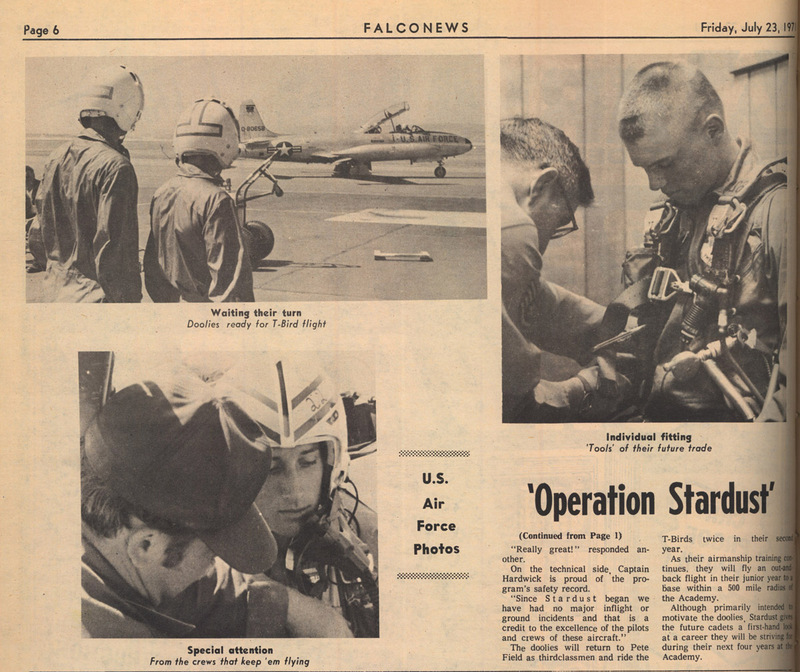 Thus, my "journey to USAFA" in 1971 started at the USNA Clinic and ended up two weeks later at the USAFA Clinic. The thing I remember most was getting on the Academy bus at the C-Springs airport and walking down the aisle to the open seat in back. I looked left and right at all the square-jawed, clean-cut examples of young America's finest – and it scared the hell out of me! It suddenly dawned on me that this wasn't just a school; it was a very competitive situation and that I had better get my act together in a big hurry if I wanted to play. John "Omar" Sherriff and I met each other before that dreaded first day at the Academy at Hungry Farmer (I think?). Then we ended up in the same squadron – I think that helped ease the shock of those first few days. July 5, 1971 was a big day for me too – as for everybody in the class I am sure. I got on a Delta jet in Columbia, SC that morning to fly to Denver. On the way I changed planes in Chicago, and I ran into a guy who looked about as anxious as I felt. I went over to ask if he was going to the Academy and he said he was, so we made the rest of the trip together. The funniest part of this was that this guy was John Charlton, who was in my BCT squadron (Guts) and who ended up being my roommate (along with Mickey Clemons) in CS-26 first semester. We got to Denver and for some reason decided to take a taxi from there to the Academy. It cost a fortune and we were still late and it took me a while to pay John back for my half, since the money I had on me probably ran out about 1/4 of the way there. We got to the "Bring me Men" ramp and lost our civilian clothes, our hair, got some great new USAFA t-shirts, and started the journey. That night I was eating in Mitchell Hall with a bunch of other Guts guys and some "real" Cadets (I found out later they were the class of '74) stopped by the table to tell us to eat up, since it was probably our last meal. The next day was a blur to me, along with the week or so after that, but I had a good guy for a BCT roommate – Charlie Parsons – and somehow I managed not to get killed or sent to K squadron. 2nd BCT for me was a lot better than 1st. I enjoyed the Valley except for the tear gas. I enjoyed shooting at the rifle range, the obstacle courses, even the pugil sticks. I liked land navigation even though the night problem we did was during such a hard rain that it wasn't quite as much fun as it would have been on a nice dry night. Probably my best BCT memory was lying in the grass at night watching a movie (I have no idea what the movie was). At least at that point it was just a really great camping trip. I think often about being there and sometimes have wondered if it was real. It was so long ago, and for me ended after one year, and so much has happened since then. I really enjoy reading the email updates from classmates – whether I knew them or not. Thanks for keeping everybody together this way, and thanks for letting us non-grads be part of the group. I thought about 5 July 1971 earlier today when I heard a golden oldies radio program mention the top 5 songs on 5 July 1971 – I thought back to where I was that day and remembered how starry-eyed I was as I saw the Academy reservation and the Cadet Area for the first time. I remember thinking I would never want to leave such a magnificent place – then two days later I was ready to get the heck out of there! 37 years ago today, we took a momentous step that forever altered the direction or our lives. Only 1404 young American men were given the unique challenge and opportunity of entering the Air Force Academy with the Class of 1975. For all 1404 of us, those first few days are certainly ineluctably seared into our memories. I had absolutely no clue what was ahead of me this day 37 years ago. I was both scared and excited. I was proud to be the first in my family to make it to college – but the prospect of attending a military institution and undergoing a curriculum shared by only the service academies (and seen by me in bits and pieces in movies) had me bewildered and more than a little shaken – especially with the thought that being screamed at by total strangers was a strong possibility. But I figured that after the first day, the yelling would stop, life on campus would settle into a routine, and I'd wear the parade uniform that I saw in the high school propaganda film (minus the falcon resting on the arm) to classes, and to town in the evenings. As I said, I had no clue. When that M-80 went off behind us, and the newly arrived BCT cadre (in shiny and impressive Service Alpha) ran through us in ranks, I could only hear the loud pulsing and thrumming of my bloodstream in my ears, and the muffled chaos of every upperclassman around us suddenly gone mad and fully intent on killing each and every one of us violently, in public, and in thoroughly horrible fashion. I knew at that point that I was in the wrong place – that I wanted to be somewhere else – and if it was possible to shrink and become invisible, I'd do it. I remember imagining nothing could be more frightening than waiting for an upperclassman to eventually get to me as they worked themselves down the line. For a minute, it seemed time had slowed down and everyone was in slow-motion. Until one of those upperclassmen reached me. I don't remember what it was he yelled at me – I remember I squeaked in response. That only seemed to make him angrier. I squeaked again – I was so scared, my voice was 2 octaves higher than normal. After an eternity of saying "Yes sir!" until I got my 19-year old voice back, I ended up running in place, getting my arms parallel to the ground, and being yelled at to get my knees up higher and higher. I thought my heart would burst out of terror. After a few minutes (which my time sense registered as forever), it was all over. We were called to attention, and we all fell back into ranks. I looked straight ahead and locked every bone in my body – there was no way I was going to catch another upperclassman's attention. Our BCT squadrons were finally dismissed and our new Element Leader and Element Sergeant either marched us to the meal or back to our rooms. That was the first day of a journey that for me at the time was both unrelentingly awful and incomprehensible. But that journey had its milestones – milestones that gave me a sense of accomplishment and exhilaration. 1. The transition from 1st BCT to 2nd BCT (where my squadron, GUTS, was top squadron, just edging out F Troop). 2. The end of 2nd BCT with the civilized march back from Jack's Valley. 3. The Acceptance Parade when we became members of the Cadet Wing and got our shoulder boards. 4. Spirit Missions during football season. 5. Recognition, when we got our prop & wings (April 15, 1972, tax day, the earliest to date back then that doolies got recognized). 6. Watching '72 graduate, knowing I'd get 3-degree shoulder boards. 7. (2-degree year was a blur to me though . . . except for buying the car). 8. Getting my firstie shoulder boards after '74 graduated. 9. Sitting in Falcon Stadium and waiting for the order, "Gentlemen, you are dismissed!" I entered the Academy on this day in 1971 on my 19th birthday. What a birthday present! Thanks for the memories! Since you asked ....... We've all heard of 4H Clubs but few have experienced (or perhaps even heard of) the 6H Club. The 6H Club would hold meetings on a dry, dusty patch of soil and rock in Jacks Valley usually about 5 minutes after the evening meal. I met there frequently during the summer of '71 with other charter members. The 6H Club you may ask ...... Happy Harry's Hellacious Horizontal Half Hour. The members of this elite club thought of adding a 7th "H" for "Hurling" but decided not to because, on occasion, not all of us had the pleasure of tasting our meal twice during the meeting! Breaaaaaaaddddddyyyy! Hi, Al. I have great memories of you and the time I spent at USAFA. I still remember at BCT when your squadron trotted onto the "intramurder" field to play mine ("I" Squadron - Invaders), and hearing y'all chant in cadence, "Invalids squat to pee, Invalids squat to pee!" Jim Carlson was not the last one accepted to USAFA for our class. I also received my appointment just two weeks prior to showing up July 4th in Colorado Springs. I cannot in good faith claim last appointed to our class though. I know there was at least one classmate (Fred Basin) who was enrolled, head shaved, etc., at West Point when his appointment to USAFA came through. He wasted no time getting to Colorado. Ted's version of my journey is mostly correct – I didn't get my head shaved at the Point – but the rest is true enough. The Point was starting before the 4th of July weekend and we started right after that. My parents had driven me there from Buffalo, NY and called home to check on things as my two older siblings had remained there. My brother informed her that the state police were looking for us and we'd also gotten a call from my state Representative asking if I wanted the USAFA appointment. My mom and I went (to the Point) to get my $300 deposit back instead of reporting in the next morning – and we promptly headed for Buffalo to make the trip to Colorado. It seems the primary had backed out at the last minute to attend a regular school. It took quite a while to get anything with my name on it. The 'rest of the story' involves my mom having a conversation with a major about why I wanted to go Air Force instead of Army – all the while he’s ignoring the long-hair (me) standing nearby. He was explaining that each person had their own preferences, when I chimed in that I wanted to fly. He looked at me with this tremendously incredulous look on his face and said "And you were going to come here???" I replied "Yeah, that's pretty far out, isn't it man?" He was speechless for a few seconds – and then bellowed "Sergeant, I need that check NOW!"